Not many local acts can attract 5-year-old children, twenty-something hipsters and senior citizens to shows. 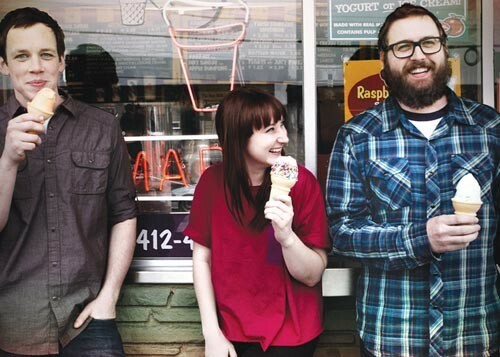 A smiling Casey Hanner seems to understand how her local pop band, Donora, generates such appeal. "I think the whole point of our band is that we're not -- "
Before she can continue, brother Jake Hanner, hidden by thick glasses and a dark beard, finishes his sister's sentence: " … cool." An air of laughter charms through the Crazy Mocha coffeeshop in Lawrenceville, where the band members sip on drinks and discuss new endeavors. Coolness aside, much has evolved in the musicians' lives since Donora's self-titled album hit the local scene over three years ago. Singer/guitarist Casey finished her master's degree in transportation engineering; bassist Jake Churton graduated from Pitt; drummer/sampler extraordinaire Jake Hanner became a proud dad (with another baby on the way). Donora's debut album opened doors for performances alongside acts like Clap Your Hands Say Yeah, OK Go and, in an interesting turn of events, American Idol finalist David Archuleta. Add licensing deals, TV placements, successful tours, airplay on local radio and multiple music videos (including a brand-new clip for single "The World Is Ours"), and it seems that Donora's hard work has paid off. The band is now ready to release Boyfriends, Girlfriends, a sophomore full-length stuffed with poppy hooks, catchy beats and lyrics that bring new life to perhaps the most common subject in music: love. "I've always been fascinated by different people's versions of love," Casey says. "There are some personal experiences on [the album], but the lyrical content mainly explores the many kinds of love and how every relationship is so different." Just as relationships vary, each song on Boyfriends, Girlfriends approaches the subject from a different lens. While not a concept album per se, the relationship premise formed after a cluster of post-debut album material didn't quite gel with the trio. "After the first album, we thought we were supposed to go in a certain direction, but that's where we got caught up," Casey says. "We wrote a lot, but weren't really excited about anything." Things changed when they re-discovered old songs Casey had penned -- songs not originally destined for Donora's catalog. Taking a chance with the forgotten demos, the band headed for the studio, where Jake Hanner took the reins with help from the Hanners' father, country musician, engineer and songwriter Dave Hanner. "We enlisted my dad as a fourth member," says Jake, "and recorded a few songs live." The session birthed "If You've Seen My Boyfriend," an intentionally 1950s girl-group-sounding ditty that served as a realization for the album's theme. "From there, we started working on a different style of songs -- more poppy," Jake Hanner says. Instead of recording live, the "more poppy" tunes originated with Jake manipulating instruments to create samples. Casey's lyrics and Churton's bass parts were later added. "You usually think of the bass as the foundation," says Jake Hanner, "but when Jake C. adds something to what we've done I think, wow, that wasn't what I expected, but that's pretty cool." Perhaps the best example appears on "And Then the Girls," which incorporates glitchy drum loops, tinkering glockenspiel, a grooving vocal part and an essential bass line that climaxes to what Churton calls "just a really happy chorus." Additional support stems from another essential resource: a reliable locally based record label in Rostrum Records (also home to Wiz Khalifa and Mac Miller). "After the album was done, [Rostrum head Benjy Grinberg] had mixed notes and suggestions," Jake Hanner says. "That's when I realized what good ears he had, which is really rare for a business person with financial backing." With tour dates to be announced soon (as Churton notes, "hopefully if you book them, they will come"), members are already fleshing out new material, "to prevent another three years in between albums," laughs Jake Hanner. For now, expect a Pittsburgh release show Sept. 16, with a national album release Sept. 27. Doubling back, I ask Casey again what makes Donora unique in the local scene. Her answer is succinct: "The whole point of us making music is for people to come out and have fun." Hit up a Donora show and who knows -- maybe you'll run into a boyfriend or girlfriend … or maybe even your grandma. Either way, plan for some fun.